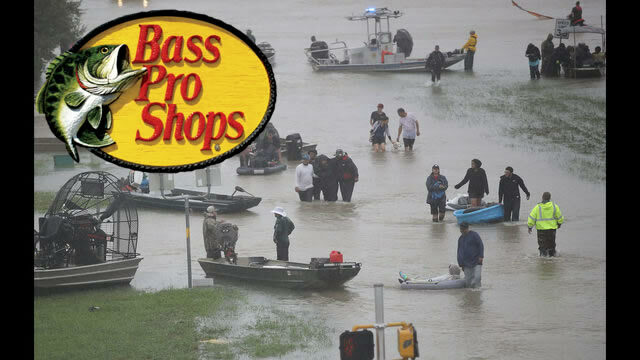 You gotta love it when you hear that Bass Pro Shops has donated 80 boats to help with the hurricane Harvest disaster. Also, Bass Pro Shops is donating $40,000 worth truckloads of supplies, including Uncle Bucks' Jerky and peanuts which supplies large amounts of proteins. Springfield-based Bass Pro said in a news release it is coordinating with local, state and federal agencies to support ongoing rescue and relief efforts related to Hurricane Harvey. Bass Pro Shops has seven locations and seven boating locations in Texas. Three are in the greater Houston area. Bass Pro is even supporting impacted employees through its Bass Pro Cares Fund, which provides support for expenses for the impacted employees.